Microsoft last week quantified its success at driving customers to never-ending payments for its software, saying that 120 million active users are on a workplace-provided Office 365 subscription plan. "We now have 120 million monthly active users of Office 365 Commercial," said company CEO Satya Nadella in an Oct. 26 call with Wall Street. That 120 million represents about 10% of all Office users; several months ago, Microsoft pegged the global Office user base at 1.2 billion. More impressive has been the payoff from Microsoft's software-by-subscription strategy. During a summer conference call with financial analysts, Amy Hood, Microsoft's chief financial officer, announced that during the June quarter, revenue for the corporate side of Office 365 had for the first time surpassed the revenue generated by traditional licensing of the productivity suite. Neither Hood specifically or Microsoft generally revealed the revenue breakdown of the two models - subscription or one-time licensing, the latter often referred to as "perpetual" licensing - then or during the latest earnings call. (Companies rarely reveal figures they're not required to, if for no other reason than that at some point those numbers could contribute to a negative narrative.) 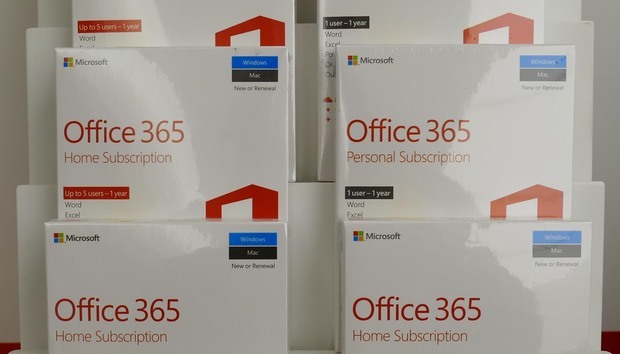 But with a 42% year-over-year increase in commercial Office 365 for the September quarter, and just a 10% boost in the entire commercial Office segment - including perpetual licensing - it's a safe bet that subscriptions again outpaced one-time payments. If just 10% of the Office audience now accounts for more than 50% of the revenue, it would seem that Microsoft has an opportunity to generate enormous amounts of revenue, assuming it eventually offers only subscriptions and can turn every user into a subscriber. Analysts believe the first is inevitable. The second? Not so much. "That 1.2 billion [Office users] includes pirated copies, copies installed by OEMs [on PCs], anyone using any sort of Office, whether [1994's] Office 4.3 or Office 2016," said Michael Silver, an analyst with Gartner. "They're not going to match up in revenue with [those already subscribing to Office 365]." In other words, some Office users are more equal, or worth more, than others - like those in the enterprise, where Microsoft focused its initial subscription strategy efforts and where it has continued to press most aggressively. But for all of Microsoft's success in implementing the Office 365 rent-not-buy model, success that the continued growth of revenue proves, when company executives talk to Wall Street they don't dwell on where that money comes from. Of course, it comes from customers. From a customer's perspective, Microsoft's ability to produce large amounts of revenue would be immaterial, except that how Microsoft goes about doing that may well affect them. If Microsoft is making more money from Office subscriptions than from one-time license purchases, and doing that on the backs of only one-tenth of the base, the implcation is simple: customers are paying more for Office 365 than they were previously for perpetual licenses. The suspicion that a subscription - actually, the never-ending payments they require - costs more than an outright purchase, is never far from the surface for customers. But is it just that, suspicion? Or is there truth to the thought? "We believe that for smaller organizations, they're probably saving money with Office 365," said Silver, who cited an August report he co-authored on the total cost of ownership (TCO) of Office 365 Enterprise E3, the most popular of Microsoft's subscription plans. "Generally, large organizations are not." According to the report, a mid-sized company of approximately 500 users would save 23% by moving to Office 365. But as the size of the organization increases, savings either dwindle or vanish completely, replaced by greater costs. Gartner's modeling asserted that a 2,500-user company would see a 10% savings, while a very large firm of 10,000 would pay an additional 9% for Office 365 than they had been spending on perpetual licenses and on-premises servers and storage. "Smaller organizations, which lack economies of scale for internal computing operations, will likely save money and have a more efficient cost structure moving from on-premises services to Office 365," Gartner stated in the report. "However, the larger the organization is, the more likely that its economies of scale make its collaboration and communications infrastructures very efficient, and moving to Office 365 is likely to increase its costs."